– EOS R has a mount inner diameter of 54 mm, it is almost the same size as 55 mm of Nikon’s full size mirrorless camera “Nikon Z” for the whole time. It has the same inner diameter as the conventional EOS system, but what is the reason for this number? Mr. Kiyota : We have carefully studied how to handle the inner diameter and position of the mount, back focus, lens diameter, camera size, including future system development. The larger the inner diameter of the mount is, the less restrictions on the lens design are, but the camera becomes larger on the contrary. When I stuffed the well-balanced part, it became 54 mm. It has the same inner diameter as the EOS of EF mount, but it was not aimed at this number daringly, as a result it became the same inner diameter of 54 mm. – In Nikon Z, 16mm flange back was appealing to the front as an important element of the system. In the EOS R system, it stays in the expression “short back focus” and does not reveal the flange back numbers. why? Mr. Kiyota : In the optical design of the lens, the back focus (the distance from the imaging surface to the rear lens of the lens) is more important than the flange back. Short back focus may increase the degree of freedom of lens design and we have designed the system to realize the lens which was impossible with the conventional EF mount. By the way, the flange back of the RF mount is 20 mm, but the back focus varies depending on the lens. – Is the sensor (imaging device) of EOS R newly developed? Mr. Kiyota : The number of pixels itself is the same as EOS 5D Mark IV, but the sensor itself is newly developed. The content has changed a lot, such as adoption of a new dual pixel CMOS AF and arrangement of microlenses according to EOS R system. Mr. Harada : There is a sensor that became a base, but it is an image that optimized according to the optical performance of the EOS R system. – Why did you adopt this sensor with EOS R this time? Mr. Kiyota : It’s well-balanced. It is not too high, but it is not too small, it is raising ISO sensitivity more than EOS 5D Mark IV. As a sensor of the latest camera, I think that it was just finished in good performance. – EOS R, is it positively an EOS 5D class camera? Mr. Kiyota : I believe so. – EOS R’s image processing engine is the latest generation of DIGIC 8, but what are the features? Mr. Harada : First of all, we have raised the processing performance drastically than before. In addition to becoming able to realize the function of the digital lens optimizer in real time at the time of attaching the RF lens, it contributes also to the performance improvement of the dual pixel CMOS AF. The performance of noise reduction has also been enhanced, and compared with EOS 5D Mark IV, ordinary ISO sensitivity has been increased by 1/3 step. – Is there a difference in image quality between the single-lens ref for EF mount and mirrorless for RF mount? Mr. Kiyota : I think that comprehensive image quality basically exceeds EOS R. The biggest difference is the digital lens optimizer that can process information coming from the lens in real time. Until now, postprocessing with DPP (Digital Photo Professional) was necessary, but in addition to being able to process chromatic aberration and distortion etc in real time without decreasing the continuous shooting speed, I can now take pictures. You can do it for a single lens reflex if you want to do the same, but the optical performance of the RF lens is improved, so it can be said that EOS R is superior in terms of image quality in that respect. – EOS R is equipped with an EVF (electronic viewfinder), not an optical viewfinder familiar to the SLR. Is there anything devised by design? Mr. Kiyota : First of all, Eye Point was pretty much stuck. I did not pursue the viewing angle and stuck to the four corners so that they could be seen from a distance, so I can see every corner even though I wear glasses. I also thoroughly tried to optically reduce the distortion of the image. Diopter adjustment range also corresponds from -4 to +2. With the optical viewfinder so far, we have not expanded it to that extent. Please try experiencing how to see. – EOS R is the same battery as the EOS 5D Mark IV (LP-E6N / LP-E6), why did you choose this? Mr. Harada : Although we examined various possibilities at the beginning of development, we decided to share with EOS 5D Mark IV in the end because there are judgments that it will be beneficial to existing users. – Although the battery is large, I feel that the grip where the battery fits is smaller than the single lens reflex EOS. Mr. Kiyota : The grip aimed at the shape that can be grasped correctly in the first place. While storing the batteries used for high amateur class cameras such as LP-E 6N / LP-E 6, the grip was not too large, and the aim was aimed at securing the clearance with the lens and making the finger cramped , This is the finish. Mr. Harada : Although it is the size of battery consumption which is a disadvantage of mirrorless, by incorporating the power saving of the device itself and the optimization of the monitor control, it is possible to use the conventional APS – C mirrorless and other company ‘s products I think that it is possible to secure the number of shooting pictures which does not contain such a color. – EOS R has been renewed in various parts, does not it? Mr. Kiyota : In addition to the operability that has been evaluated in the EOS series so far, incorporating new operability such as multifunction bar and control ring, high amateurs can customize their favorite and enjoy comfortable shooting I tried to get it. The control ring introduces the same mechanism in the PowerShot G series of compact digital cameras and the like. Since this time EOS R becomes a new system, I thought that I could put control rings that enhance operability with the same idea as a compact camera and introduced it. Of course, there is also the aim to strongly tell you that it is a new system. Mr. Harada : With the adoption of EVF, various information can now be displayed in the viewfinder during shooting. I think that being able to operate lightly without looking away from the viewfinder is one of the new attractions of this camera. – In the camera of the EOS R system, does the multifunction bar and control ring always exist? Mr. Kiyota : Since it is not essential for the EOS R system, cameras and lenses not equipped with these are possible. As for the system, although it makes it possible to operate in the same way even without a bar or ring, EOS R devises it so that it can be used only with this camera with a control ring and a multifunction bar. – Is there a possibility of installing a control ring in the EF lens in the future? Mr. Kiyota : In control of the control ring, I think that it is basically not used because it uses contacts increased with new mounts. – In the roadmap, the introduction of a large aperture zoom lens of F 2.8 is planned. Is it a compact design compared to the EF lens? Mr. Kiyota : I think there are many ways of thinking about lens design. It is like touching the same F 2.8 but making it small, conversely it is big but I make it high quality. The EOS R system is characterized by the flexibility of various lens designs, so it does not mean that all lenses are made smaller. – EOS R did not install the camera shake compensation mechanism in the body. In the EOS R system, is it a policy that the camera shake correction is left to compensation in the lens? Mr. Kiyota : When installing the image stabilization mechanism inside the body, you must overcome the challenges such as size, cost, heat generation. Regarding EOS R, after considering various things, it became such specification. Of course, it does not mean not to put the camera shake compensation mechanism inside the body. We will select and judge the nature of the camera. – I think that there was a policy such as that it is better for the SLR camera equipped with an optical viewfinder to compensate for camera shake. Is there no such thing in mirrorless mounting EVF? Mr. Kiyota : Basically not. Mr. Harada : When attaching a telephoto lens, there is the merit of in-lens image stabilization that the correction angle can be secured sufficiently when the focal length is long. However, since I fully know the merit of camera shake compensation in the body, I will consider it including it. – Regarding lens lineup, it seems that there is no low price lens suitable for stepping up from the APS – C mirrorless of the EF – M mount, centering on high performance L lens. Mr. Kiyota : Indeed, considering step-up from EF-M, RF lenses may be more expensive and more priced. First of all, it is a strategy to recommend the EOS M series to those who want to step up by those who used the EOS middle level machine, and want to use light cameras at affordable prices. – I think that Nikon Z 6 will compete with Nikon for both price and pixel counts, but are you thinking of a top model like Nikon Z 7? Mr. Kiyota : First of all, I will introduce EOS R as a well-balanced middle class, but of course I am thinking about the higher and lower models than that. In particular, since other companies are issuing higher pixel models, we believe that there will be many requests from those competing models. – This time, it was related to the fact that only one model was launched because we developed a sensor on our own? Mr. Kiyota : There are 50.6 million pixel EOS 5Ds, and there is no such thing as the self-development of the sensor has been a hindrance. – What is the possibility of CINEMA EOS using the EOS R system? Mr. Harada : I think there is a possibility. Since mirrorless is compatible with movies, it will be easy to make cameras specialized for movie functions, and CINEMA EOS using EOS R system thinks. – Can we support 8K in the future? Mr. Kiyota : We are assuming 8 K as an EOS R system. However, regardless of specialty fields such as broadcasting stations, there is a doubt that ordinary users need 8K in the first place. Even if you can shoot, there are issues such as whether there is a device that displays 8K, what to do with heat treatment, how to handle handling deterioration due to enlargement of file size, so carefully consider including those points first I think that it is necessary to go. – With conventional single lens reflex EOS, EOS M, EOS R, Canon has three lineups of interchangeable lens cameras. Is the development resource okay? Mr. Harada : Since we are still developing right now, that point is OK. We are developing it while devising various things, such as concentrating resource to the place which we have to specialize while efficiently proceeding the part that can be developed in common. With the development of simulation technology, it is also helping that the development period and expenses etc are shortened compared with the past. 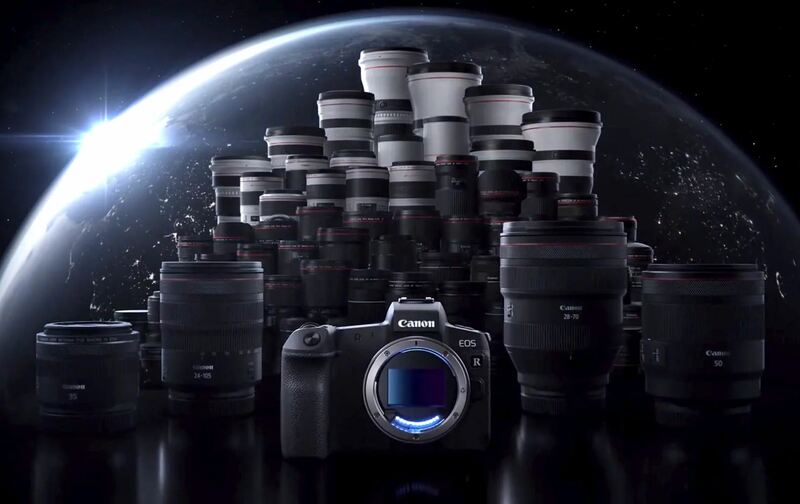 Previous Previous post: Firmware Update with News Features will Coming Soon After Canon EOS R Released !